WHY NEW HEALTH COVERAGE OPTIONS MATTER TO ME Health Insurance in 3 Easy Steps Open enrollment for the Health Insurance Marketplace will take place from November 15, 2014 to February 15, 2015. Here are three steps to guide that process: Decide what kind of coverage you need If you do not have insurance (through your employer, Medicare or Medicaid, for example), you can choose a health plan that fits your budget through the Marketplace. Figure out how much you can afford to pay each month, and if there are any specific doctors, services or medications you will want covered. Gather the required information for enrolling To apply for coverage, you will need to provide your date of birth, current income, employer’s name and address and current insurance information, if applicable. In some instances, you’ll need to provide info for other household members. You’ll also need a Social Security number or an immigration document number and type. How does the Marketplace affect older people age 50+? For older people under age 65 and uninsured, the Marketplace provides a variety of insurance plans to make health care affordable for you and your family. 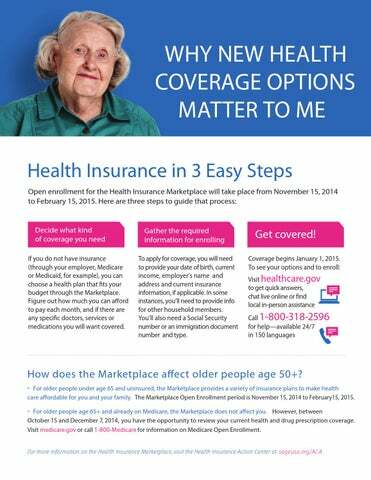 The Marketplace Open Enrollment period is November 15, 2014 to February15, 2015. WHY THE ACA MATTERS TO LGBT OLDER PEOPLE Lesbian, gay, bisexual and transgender (LGBT) older people stand to benefit greatly from health coverage expansions under the Affordable Care Act (ACA). These expansions include the Health Insurance Marketplace, the Medicaid expansion, new benefits for elders 65+ on Medicare, and a range of protections that make health care more accessible for LGBT older people. Here’s why the ACA matters to LGBT older people: Reducing disparities in coverage Research shows that LGBT people are less likely to have health insurance, and the number of uninsured older people age 50-64 continues to rise— from 3.7 million in 2000 to 8.9 million in 2010. Improving health at all ages Without insurance, many people delay care, which can exacerbate poor health. LGBT people across the age span deal with significant disparities in multiple areas related to physical and mental health. An older person’s poor health represents the cumulative effect of a lifetime of discrimination. “[LGBT people] age 50–64 report lower rates of health insurance coverage and are less likely to have a personal doctor and routine checkups than older age groups. Those 50–64 also report higher rates of being denied healthcare or having received inferior care, higher emergency room use, more financial barriers to seeing a doctor and obtaining medication, and greater fear of accessing services outside the LGBT community…” The Aging and Health Report: Disparities and Resilience among Lesbian, Gay, Bisexual, and Transgender Older Adults, Institute for Multigenerational Health, University of Washington, 2011. Expanding protections and benefits for everyone The ACA prevents health insurers from denying coverage or charging higher premiums based on pre-existing conditions, or a person’s sexual orientation or gender identity. This is a significant step toward expanding health care access for transgender people and people living with HIV/ AIDS, who often face life-threatening discrimination in coverage. And new benefits for elders on Medicare improve access to preventive services and reduce prescription drug costs. Services & Advocacy for GLBT Elders (SAGE) is the country’s largest and oldest organization dedicated to improving the lives of lesbian, gay, bisexual and transgender (LGBT) older adults. 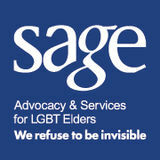 Founded in 1978 and headquartered in New York City, SAGE is a national organization that offers supportive services and consumer resources for LGBT older adults and their caregivers, advocates for public policy changes that address the needs of LGBT older people, and provides training for aging providers and LGBT organizations, largely through its National Resource Center on LGBT Aging. With offices in New York City, Washington, DC and Chicago, SAGE coordinates a growing network of 27 local SAGE affiliates in 20 states and the District of Columbia. Learn more at sageusa.org.